Nestlé USA announced a voluntary recall of Ultimates - refrigerated cookie dough product, not the sport. We are taking this action out of an abundance of caution after being notified that the FDA, together with the CDC, are conducting an investigation into reported E. coli 0157:H7 illnesses that may be related to consumption of raw cookie dough. A number of consumers reporting illness reported consuming raw Nestlé TOLL HOUSE refrigerated cookie dough. While the E. coli strain implicated in this investigation has not been detected in our product, the health and safety of our consumers is paramount so we are initiating this voluntary recall. We want to strongly advise consumers that raw cookie dough should not be eaten. This message also appears prominently on our packaging. You can bank on OurBX vacation being booked, just don't wait for the annual mid-October vacation to pay for itself. REMINDER to send a check towards TakPark. MattHew is moving out within! Welcome MATthew will now be in front of his condo in the Starbucks-heavy Arlington, Va - a shift closer to a METRO, the river (& pickup). As we trust computers to help run our lives more & more, it’s unfortunately humbling to see the effects when they go awry in the METRO-area. For humans interested in movie-related fiction, the second generation of the robot toys “TRANSFORMERS: Revenge of the Fallen” is out in theaters now. 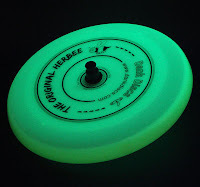 Don't be GREEN with ENVY, be Green with Frisbee. Descrip: When it comes to enviromental friendly good times, the sky's the limit with this groovy flyer. 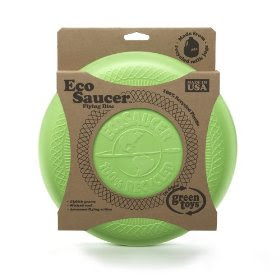 The Green Toys EcoSaucer Flying Disc is made in the U.S.A. from sturdy 100% recycled plastic milk containers that save energy & reduce greenhouse gas emissions. Weighing in at 130ish grams, it soars with Good Green Fun. For ages 5+. Rob officially moved in to his apartment in Reston, Virginia. It feels exactly like being on the Pacific Coast if you squint looking at the sunset, creating the sounds of waves crashing all while soaking your feet in his roof deck POOL. You may ask yourself-well...how did I get here? Still lost on whether it's a turnover if the disc touches a long piece of grass/weed?? 3. The playing field and surrounds should be essentially flat, free of obstructions, and afford reasonable player safety. Well-trimmed grass is the recommended surface. :Receiver: Any offensive player either in the act of catching the disc, or not in possession of the disc. 6. If a pass arrives in such a manner that it is unclear whether a catch was made before the disc contacted the ground (grass is considered part of the ground), the player with the best perspective makes the call. Mike serenaded us with Milk Days Are A-Comin'. Now, the musical outfit MicHael is affiliated with - STONEY LONESOME - is gonna rock ya! This rare live performance is in conjunction with DC's (free) family-friendly & friend-friendly Fort Reno Concert series. Yes, the very same subversive concert venue where little known DC bands (Fugazi [live vid], Georgie James [music vid], The Evens) have played. Please do not judge society on the lack of progress in commericals. Beam-O, the Flying Hoop, has some funny Seldom Asked Q's. Price: $17 (20") & $25 (30") + shipping. A: MicHael is in Colorado. A: David is in South Carolina. As fore-casted, EASports' Tiger Woods PGA TOUR 10 is teeing off for another season! Available in retail stores today! If you got Wii, the Disc Golf bonus feature allows fans to trade in their golf clubs for a new way to play all championship courses featured in the game. It might be cliché, but on Saturday it was TRUTHY - so much weed wuz on da friz field! With all the large rain dumps in the past weeks, our summer pickup spot has been overtaken by very tall grass & weeds. Not good for anyone allergic to grass; fun for those who like to layout on more cushion-y ground. Bring your sickle the next time you show up to play pickup. The rescheduled DTV transition - where all full-power broadcast TV stations in the U.S. are scheduled to stop broadcasting on analog airwaves and begin broadcasting only in digital - is today. Once the DTVransition goes into effect, residents who watch free, over-the-air television through a rooftop antenna or "rabbit ears" will need to obtain a digital-to-analog converter box, sign up for cable or satellite service, or buy a digital television. All this so you can enjoy sit on your couch staring at improved picture & sound quality, plus more channels and programming + commericals. Whatcha gonna do this weekend? The Federal Budget wishe$ it could come close to the # of wins Sludge had on tournament Saturday. Based on the instructional video, BudBall is a hybrid of ult frisbee + Monopoly. Budgetball is an active sport of quick passes, tough defense & bold comebacks designed to increase awareness of the national debt and reward strategic thinking and collaborative problem-solving around the issues of fiscal responsibility. Pass the Ball, Not the Buck. A surplus of Vitamin-I? 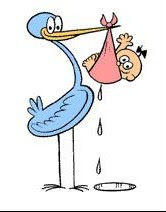 This would NEVER happen to Sludge. Q: I have a bottle of expired ibuprofen tablets. Will they still work if I have nothing else? 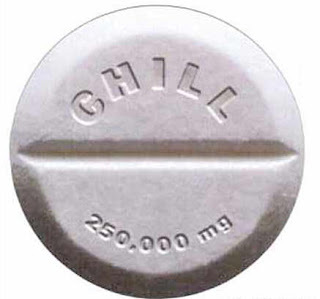 A: If your ibuprofen was capped and properly stored, it might still be effective. Drug products certified by the USP (a leading standards authority) retain at least 90% potency up to their expiration month, and manufacturers typically choose conservative expiration dates anyway it ensures that products are purchased regularly. Research suggests that most meds, in both opened & unopened containers, are safe & effective at least a year or two past the expiration date (provided they're kept in a low humidity environment so don't store pills in your steamy bathroom). Still, practice common sense: Risk an expired pill for sore muscles, if need be but if it's a potentially lifesaving daily aspirin or prescription med, don't put your trust in an expired batch. This flying disc's mental development may be more advanced than other flying discs. Descrip: Instant messaging just got a whole lot more fun! Now with the DUNCAN Throw & Tell™ Flying Disc - world's first flying disc - you can leave a message & send it to your friend as far as you can throw. Weighing 160 grams, the Throw & Tell has the weight and balance of a high-performance disc for long fights, but with the added record/play feature for lots of fun! Messages can be up to 6 seconds long. Simply depress a button to activate the recording. Once a red light appears, the message can be recorded. Then throw for speedy delivery! With a touch of a button, the recipient can retrieve the message. The message may be erased and re-recorded. Great for all levels of play! A horse jockey is a horse jockey...of course, of course. Summer Bird, sent off at 11-1 odds, gave jockey Kent Desormeaux a Belmont victory he desperately wanted. The winning time for the 1.5 miles was 2:27.54. Last year, he won the Derby & Preakness aboard Big Brown, only to have to pull up the colt in the 2008 Belmont. Houston, we have a problem with the "Houston, we have a problem" quote. LOVELL (CDR): I believe we’ve had a problem here. CAPCOM (CC): This is Houston. Say again, please. Msg: I just reserved #115, the Moon. Can you do twirl the pizza...? Frolic near the bank of the mighty Potomac River. 411: Bring a white & dark shirt; sunscreen & plenty of H20 (to drink; not precipitation). "[Reseach has] successfully proven that concrete can indeed be made to fly considerable distances!" INCREDIBLE as it may seem, concrete can indeed be made to fly, as demonstrated by three Curtin University of Technology, Sarawak campus students. The three final-year Civil and Construction Engineering students – Jasony James Padasian Ajuni, Ng Boon Yuh and Gan Tze Neng – not only made frisbees outof concrete, but also made them fly for distances of more than 35 metres at the Inter-varsity Concrete Frisbee Competition 2009 (ICFC 09) in Tronoh, Perak. “Making frisbees out of concrete did not seem all that plausible at first, much less make them fly, but we did it, and we even came out tops in the competition,” said an elated Boon Yuh. He added that it took a fair amount of experimentation to get the frisbees just right and to perform as required, but it was well worth the effort. In addition, their frisbee came in second in the weight test in which the lightest Frisbees scored the highest points, and made a good showing in the durability test where frisbees were dropped from a certain height and points awarded to frisbees with the highest retaining weight ratio after the test. Other competition criteria included accuracy and poster presentation (?). Their concrisbee pummels the (now) lame paperisbee.